The soul of Guangxi ! Recognized by UNESCO, the wealth of Guangxi is not limited to rice terraces spread over the horizon, local folklore, rivers meandering the land, the sweet melodies of traditional songs or mountains to the pace if majestic that the desire to climb them crosses you. The only way to understand the extent of its beauty is to stride accross. Here is a circuit that will satisfy all the curious! Whether you choose to walk, pedal or climb, you will be captivated by the charm of this landscape. And this whatever the time of the year! In this program several options can be proposed according to your desires. Day 1: Guilin - Chengyang ~ 4h30 drive. Flight to Guilin in the morning. Reception of your driver and guide then departure to Chengyang, a large village of the Dong minority (4h30 drive). Installation in a wooden inn in the village. 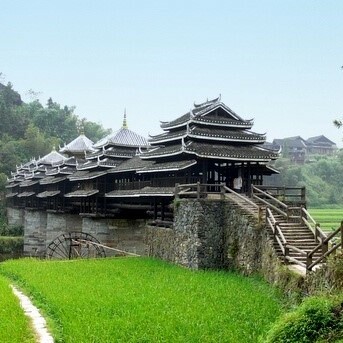 Discovery of the village of Chengyang renowned for its wind bridge and Rain 78 m long surmounted by 5 elegant towers. Walk up a hill to a pagoda where the view of the surrounding Dong villages is superb. Continue walking tours of villages around Chengyang to see several drum tours and wind and rain bridges, some of which are over 100 years old. Attend a local dance presentation on the village square. Accommodation in a standard 3 * hotel in the nearby city of Sanjiang or in the village in a hostel (simple comfort). Morning departure to the rice paddy area of ​​Longsheng or Longji (Dragon’s Backbone), north of Guilin, gathered around the village of Ping’an and Dazhai. Arrival below the village of Ping’an, which you will reach on foot after 30 minutes of walking (porters available). Installation in your wooden inn. In the afternoon take a short hike up the rice paddies of the Dragon’s Backbone. Great view from the top of the rice fields. Meeting possible with Yao women, famous for their beautiful embroidered pink costumes, their heavy jewels and their long hair sometimes touching the ground! Accommodation in your wooden inn the Starwish Inn 3 * (good comfort with air conditioning), or other hostels. Day 3: Ping'an - Yulong - Yangshuo ~ 3h30 drive. This morning find your vehicle by walking to the old village of Longji (2:00). Drive to Sugar Loaf area south of Guilin to the old village of Jiuxian. After lunch bike ride in the countryside off the beaten track on small paths along the Yulong River, through sleepy hamlets, rice paddies, peanut fields and fish ponds until the 400-year-old dragon bridge years (also called Yulong Bridge). Return to Jiuxian by the other side. (Optional option to return part of the way in a real bamboo raft, without motor, powered by a gondolier on the bucolic Yulong river. Then transfer by vehicle to the village of Yangshuo still very lively. Installation in your hotel. In the evening, enjoy traditional lantern fishing with tamed cormorants. 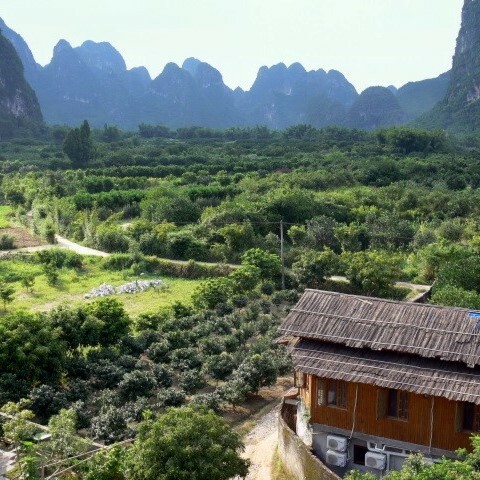 Accommodation at the River View hotel located in the center of Yangshuo facing the river near the pedestrian area or the Riverside Retreat located a little away from the city on a hill and with a magnificent view of the karst peaks. Day 4: Yangshuo - Yangdi - Xingping - Yangshuo ~ 1h20 drive. Departure by car towards 9:00 am to the Moon Hill, a large pierced mountain, the natural emblem of Yangshuo (observation from below or ascension on foot with steps that will take you to the foot of the arch.) 40min walk to at the top). Then visit the Silver cave with beautiful rock formations (the cave is arranged and lit). 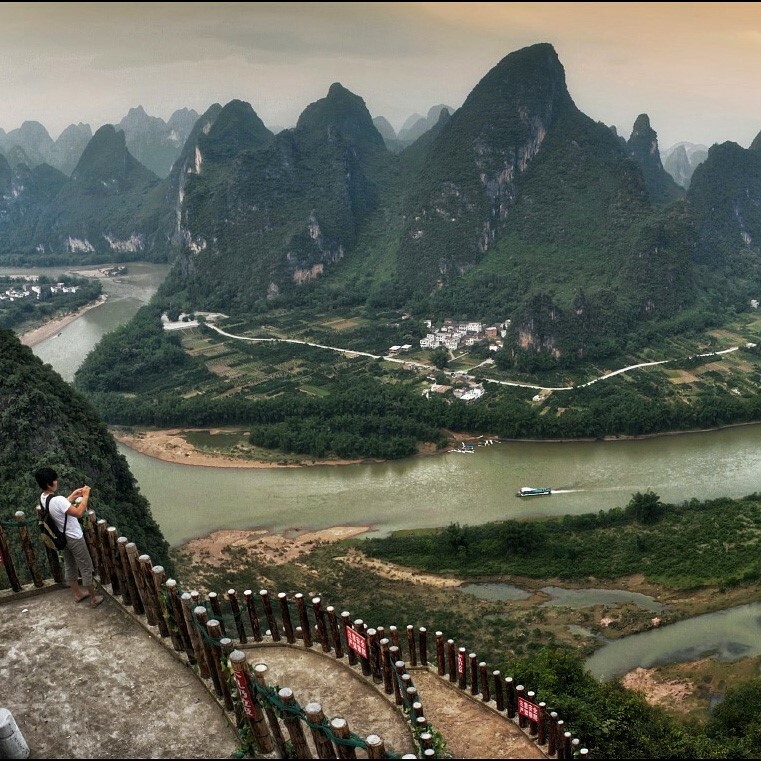 Continue to the Li River and the beautiful Xianggong World Heritage Site. After lunch on the spot, drive to the village of Yangdi for a small raft ride on one of the most beautiful portions of Li River between Yangdi and the hill of the 9 horses, through small fishing villages, rice fields and groves bamboo. 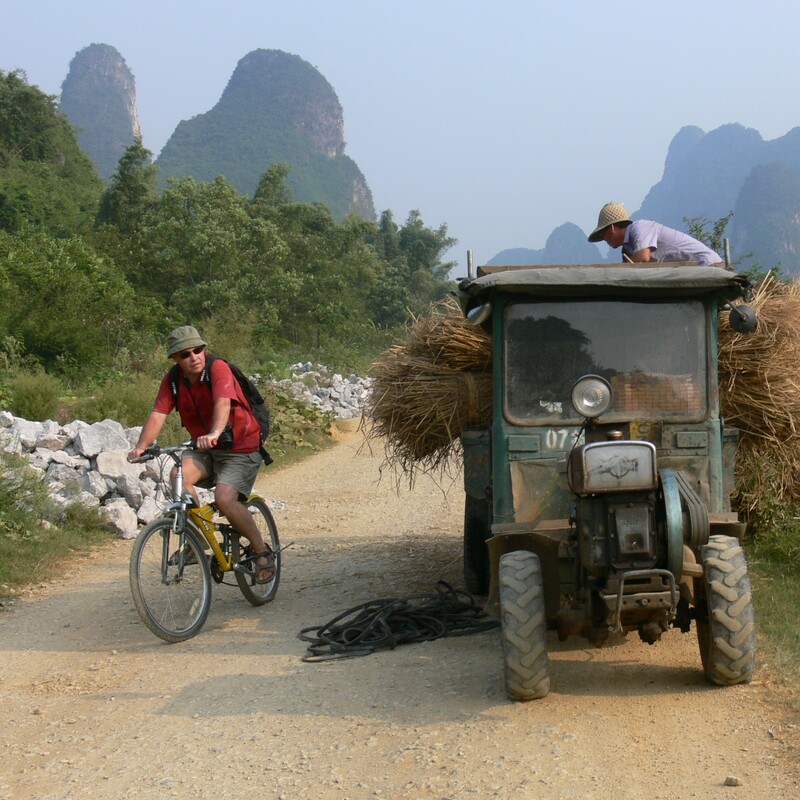 Continue on foot or by electric vehicle (included) to the village of Xingping and return to Yangshuo by vehicle. In the evening, you can enjoy the sound and light show “Liu San Jie”, based on a very popular Chinese musical, directed by Chinese filmmaker Zhang Yimou. 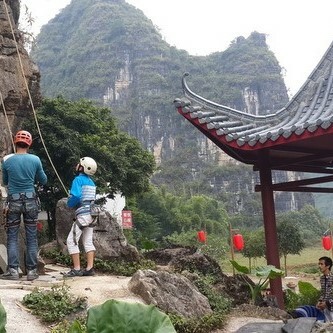 It takes place on the Li River in a beautiful natural setting surrounded by karst mountains (not included in the estimate: 200RMB / pers place standard + transport). Day 5: Yangshuo - Fuli - Liugong - Guilin ~ 1h20 drive. Today bike ride (or electric scooter, surcharge 50RMB / scooter) to the village of Fuli on small roads further down the Li River (16km round trip). Cycling to the village of Liugong (+ 15 km return). Visit of the village and climb to the top of the small temple hanging on a cliff. Nice view of the meanders of the river. Back to the village of Yangshuo by bike and transfer by car to Guilin station. End of our services. Their length depends on the physical condition and the interests of the participants (discovery of minorities). Sometimes you have to seize opportunities on the spot (party). DECEMBER to MARCH: The rice fields are empty, and generally dry. On Yangshuo citrus fruits are harvested (pomelos, persimmon …). APRIL: First rains. Rice fields in water on some plots. Plowing. First sowing on a small plot. MAY: Rice fields in water. First sowing and transplanting. In Yangshuo the seedlings begin to be transplanted throughout the field. In Longji this is done later in the month. JUNE: Generalized transplanting. Rice is growing. Light green. JULY: Rice growing. The first plants around Yangshuo are maturing. The rice fields are yellow and green. First harvest at the end of the month. In Longji the rice fields planted later are still green and young. AUGUST: Generalized harvest around Yangshuo, with the preparation of the second plantation. Patchwork of green, yellow and rice paddies in water. In Longji the rice plantations are taller and green. SEPTEMBER: On Yangshuo all rice fields are in full growth and green. On Longji the rice matures and begins to turn yellow. 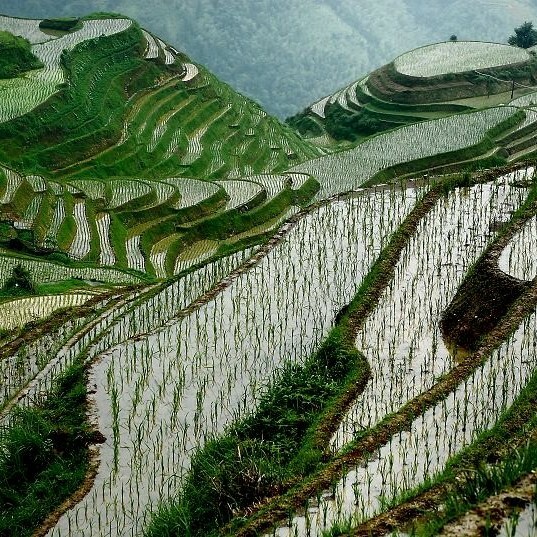 OCTOBER: The rice is green on Yangshuo and begins to turn yellow at the end of the month. In Longji rice is harvested the second week of October. From the 3rd week there is no more rice in the rice terraces. Straw hats and burnt mists occupy the land. NOVEMBER: This is the second rice harvest on Yangshuo. Yellow rice fields and gradually empty.